When the people heard this, they said, "Then who can be saved?" 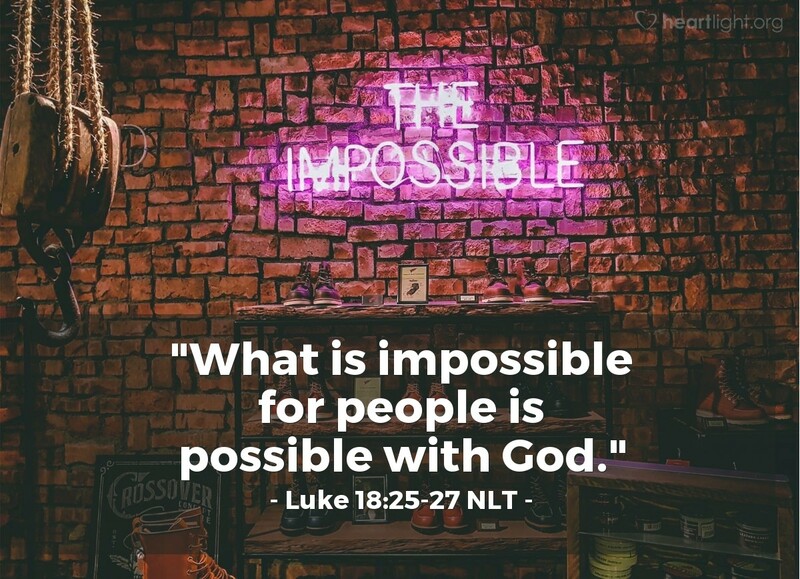 Jesus answered, "God can do things that are not possible for people to do!" Many things are hard for us. Others seem impossible. Jesus wants us to realize that when we live for the Kingdom—if we trust in God's power to be at work within us—then we can do far more than we would ever imagine as possible. The real issue is putting God first and not letting anything take his place of preeminence in our hearts. O LORD God Almighty, I believe you parted the sea for Moses, stilled the storm through Jesus, and healed the lame man through Peter and John. I know you can also do amazing things in my life as I live for you and your Kingdom. In Jesus' name. Amen.